Rather than replacing the shower, we used tub and tile paint to refinish a shower! 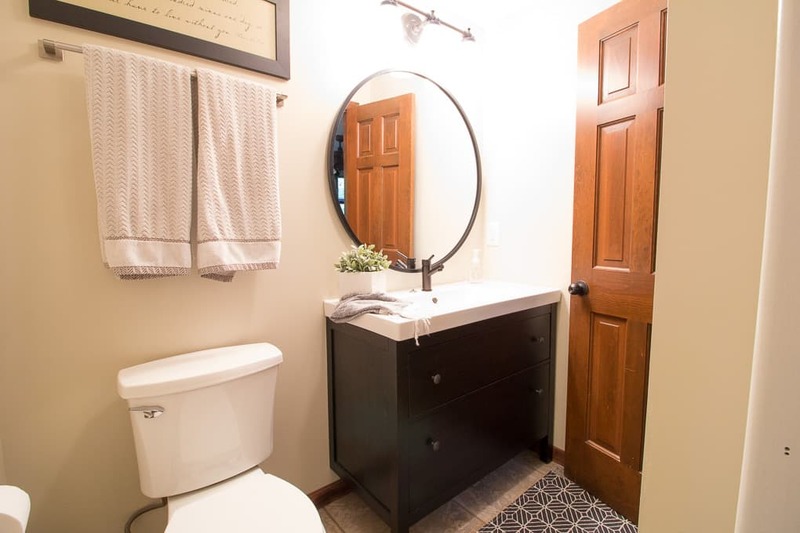 See all the details of our modern bathroom updates! 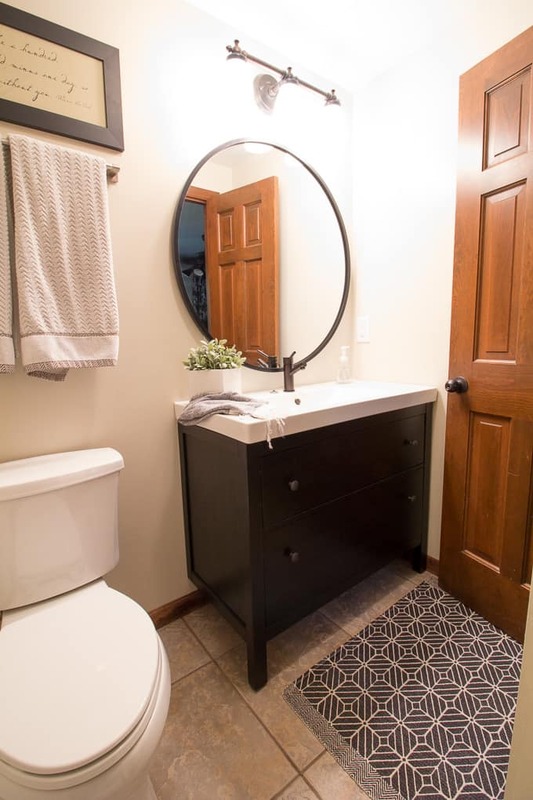 **This post contains affiliate links** First I painted this bathroom the same “Edgecomb Gray” color as the rest of house. 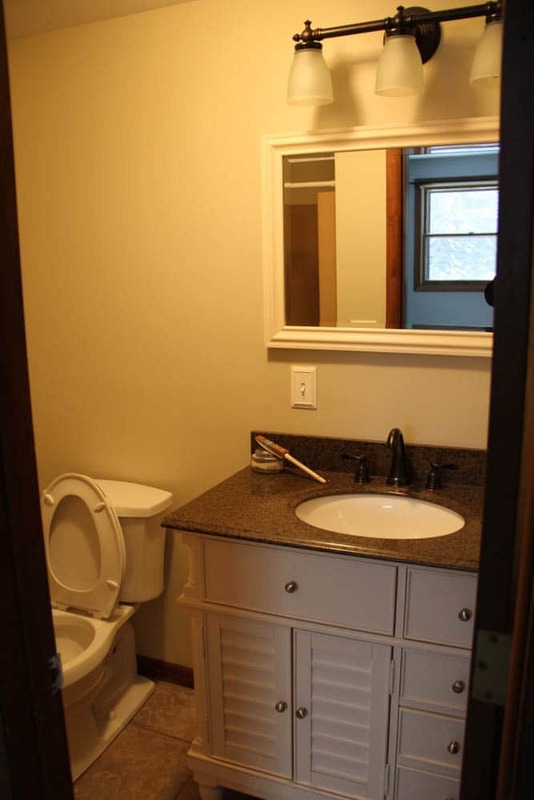 Then we added a new Ikea vanity. Thankfully it was on sale when I purchased it. Then I added this Umbra mirror that I have been loving since I put it into my friend’s modern bathroom. I didn’t really “decorate” this bathroom, but I did add this rug from H&M, along with my favorite hand towels I always grab on Amazon. I also already had this shower curtain. 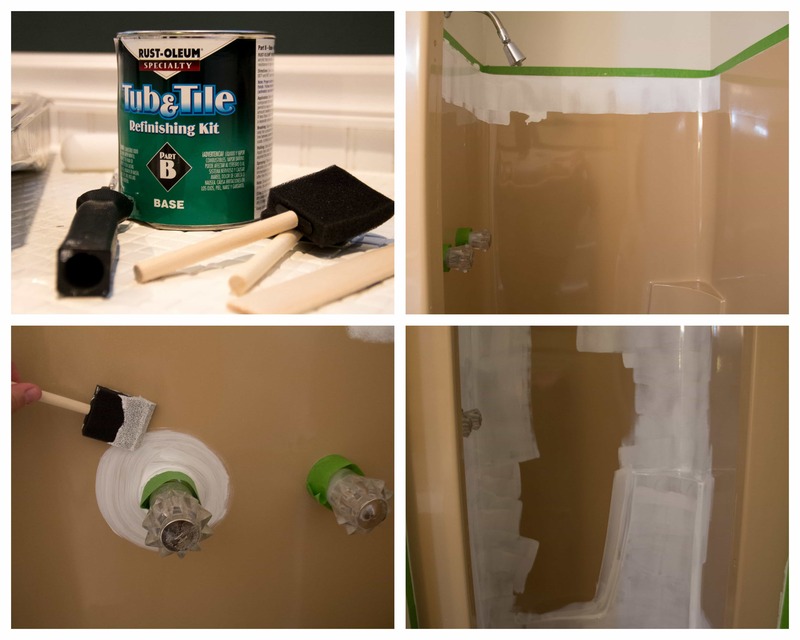 Then came the most impactful part of this budget makeover, using tub and tile paint to refinish the shower. 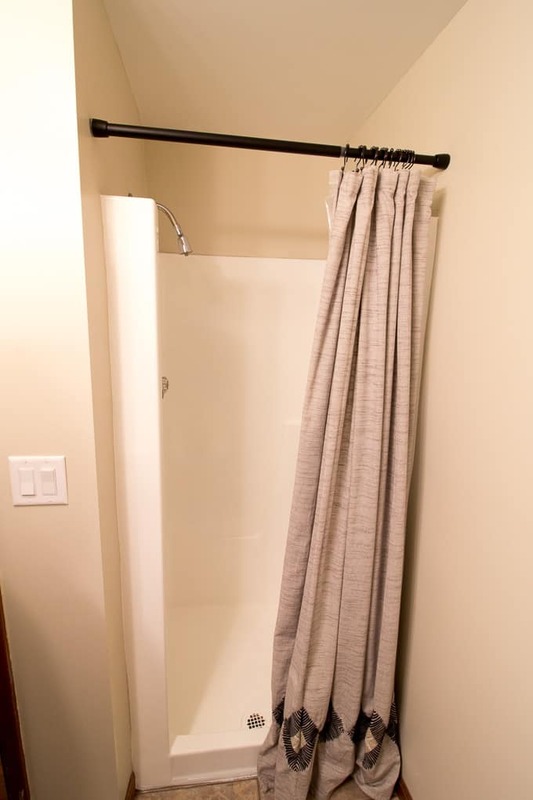 Originally the shower was this awful brown color. Start by taping off everything well. This paint is VERY drippy and hard to edge. Make sure the room is ventilated well. We opened all our bedroom windows and had both fans on and it was still VERY strong. Use a foam roller and foam brush to coat shower. My shower took three coats and two packages of tub and tile paint. I probably had about half a can left once I was done. Remove tape and enjoy your bright new shower! I’ve used tub and tile paint a ton in the past. Once to refinish our tub. Later on our backsplash, then another time to paint our tile countertops. It’s not quite as durable as having it professionally re-glazed, but pretty darn close. If you’re good with doing an annual touch-up then I’d say this is the way to go! 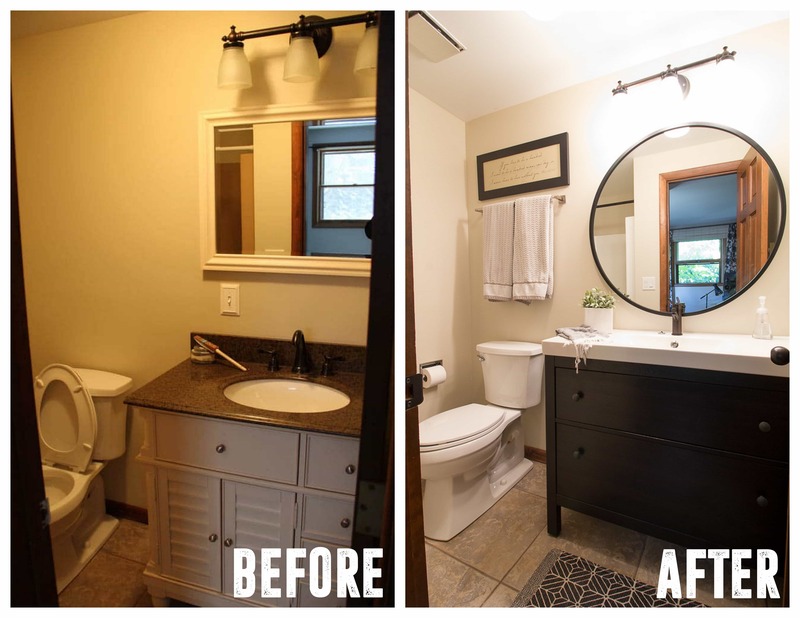 This makeover definitely wasn’t pennies, but also was much cheaper than if I would have built a tile shower. 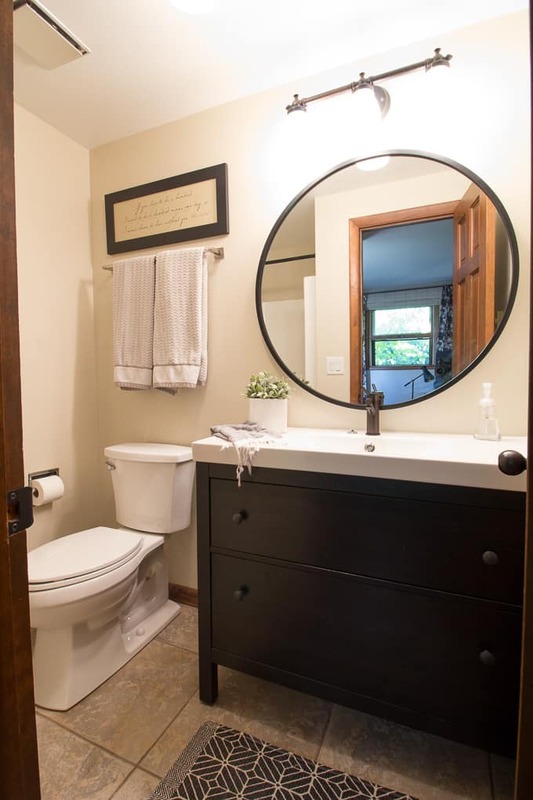 If you’re unhappy with your bathroom, I hope this post inspires you to tackle it with tub and tile paint! I hope you love this transformation as much as I do! Do you have to give it any special cleaning before painting. Did you use it on a fiberglass stall.